As the first fall freeze approaches, many of us are closing up our homes for winter. But did you know that when you seal up your house to keep the heat in, you are reducing fresh air exchanges and could be trapping elevated levels of harmful radon gas inside your home? Radon gas is produced when uranium in the soil breaks down. The gas then moves up through the ground and seeps into homes through cracks and holes in the foundation. 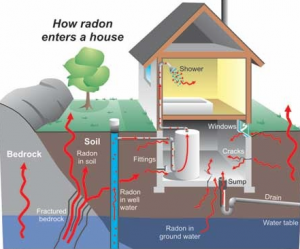 Once radon enters the home it can build up to dangerous levels. When people in the home inhale indoor air, radon gas particles can get trapped in the lungs and create a risk for cancer. In fact, radon exposure is the second leading cause of lung cancer in the U.S. with smoking and second-hand smoking being the first and third leading causes, respectively. Each year, cancers linked to radon gas exposure are responsible for approximately 21,000 deaths. The EPA strongly recommends that all homes with radon levels of 4 pCi/L or more be fixed because this is the level at which the risk for cancer starts to really take off. Most areas of the Midwest have been categorized as having a moderate to high risk of indoor radon levels at or above the action level, and homes in Iowa and Western Nebraska have the highest potential for average indoor radon levels greater than 4 pCi/L. People who live in these areas need to be especially vigilant about testing for radon, especially during this time of year when the perfect conditions for radon build up are present. It is important to know that no home is exempt from radon. While homes with basements are often thought to be at a greater risk for radon, this is not the case; radon can enter and become trapped in any dwelling, whether it’s an older drafty house, or a well-sealed new home. Eliminating radon buildup is especially important during this season when we are spending so much time in our homes. Unfortunately, radon gas is colorless and odorless, so there’s no way to find out if you’re being exposed to radon unless you test for it. If your home is found to have elevated radon levels, you can have a radon mitigation system installed to draw the toxic gas away from the structure before it can enter your home. and minimize occupant exposure. You can also be proactive by minimizing the risk of radon entering your home in the first place.